Why Use Safety Rubber Surfacing? 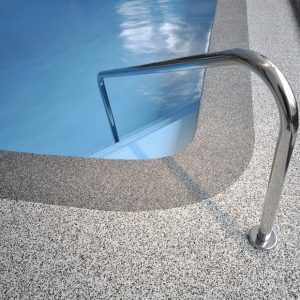 Our unique combination of EPDM rubber and resin is slip resistant when wet, much like a bath mat, making it perfect for pools decks and splash pads. 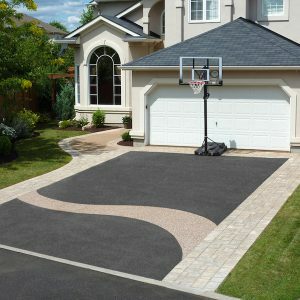 Rubaroc has been installing since 1983 with great results! We stand behind our product, and that’s why we offer a 10 year warranty. Our rubber has give and accommodates to ground changes due to temperatures. We can use the material to cover existing cracks on concrete. Our installers are professionally trained by Rubaroc experts. We don’t settle for anything else but excellent work! Depending on the size of the job, our installers usually only need a day or two to complete the work. Your new surface will be ready to be used within 24 hours of completion. We offer a vast array of colors and combinations which make it easy to match your surface to its environment. We also offer custom design work. Safety surfacing with Rubaroc® combines proprietary high tech polymer resin with the highest quality EPDM rubber to create a resilient, slip resistant surface that is virtually indestructible. 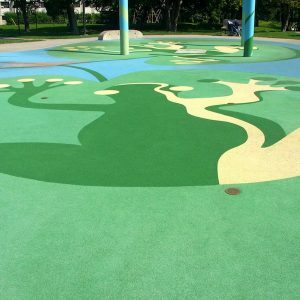 The rubber and resin mixture is hand troweled on site to provide endless application possibilities, from filling concrete cracks, to custom color mixtures and designs, Rubaroc® makes safety beautiful. Rubaroc® is impervious to mold and bacteria, cooler than concrete in hot temperatures, skid resistant, and stretches to accommodate the ground movement caused by temperature changes. 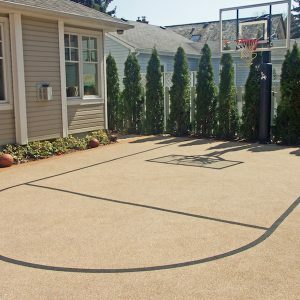 All these features makes Rubaroc® perfect for areas such as pool decks and splash pads, sport courts, playgrounds, golf courses, walkways, driveways, and more. Installing Rubaroc® is not a do-it-yourself project, only trained professionals are qualified to install this wonderful product. After completing the required installations training, Arizona Safety Surfacing has acquired the Authorized RubarocPRO status. Give us a call today to schedule a free consultation. We will assess you area, talk with you about different color options, and will provide you with an accurate quote. Our team counts with all the necessary knowledge and the tools to complete your project and exceed your expectations. RubarocPRO Installers are independently owned and operated, and are neither affiliated with nor agents or representatives of Rubaroc®.